(Nanowerk News) Delivering the capability to image nanostructures and chemical reactions down to nanometer resolution requires a new class of x-ray microscope that can perform precision microscopy experiments using ultra-bright x-rays from the National Synchrotron Light Source II (NSLS-II) at Brookhaven National Laboratory. This groundbreaking instrument, designed to deliver a suite of unprecedented x-ray imaging capabilities for the Hard X-ray Nanoprobe (HXN) beamline, brings researchers one step closer to the ultimate goal of nanometer resolution at NSLS-II, a U.S. Department of Energy Office of Science User Facility. Multi-layer Laue lens module inside the vacuum chamber of the microscope installed at the Hard X-ray Nanoprobe beamline at NSLS-II. The team of scientists who built this microscope aren’t stopping there; they are working toward making the focused x-ray beam spot even smaller in the future. The microscope they developed produces x-ray images by scanning a sample while collecting various x-ray signals emerging from the sample. Analysis of these signals helps researchers understand crucial information about the materials they are examining: density, elemental composition, chemical state, and the crystalline structure of the sample. Getting a clear image at this scale requires extremely high stability of the microscope to minimize vibrations and to reduce possible thermal drifts, changes in the microscope due to heat. It requires over twenty piezo motors — very fine motors that produce motion when electric currents are fed into piezo crystals — controlled down to nanometer-scale precision, crammed into a tight space about the size of a coffee maker, to meet its functionalities. “This instrument incorporates most recent developments in interferometric sensing, nanoscale motion, and position control. Recorded drifts of two nanometers per hour are unprecedented and set a new benchmark for x-ray microscopy systems,” said Evgeny Nazaretski, a physicist at NSLS-II who spearheaded the development of the microscope. 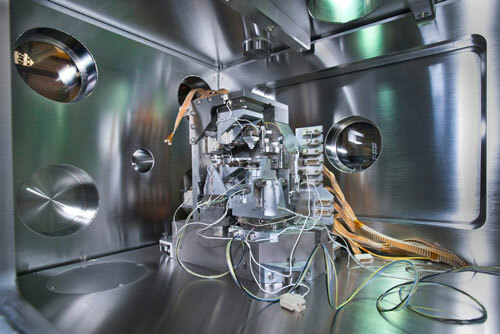 After construction, the MLL module, a key component of the HXN x-ray microscope, was tested at the Diamond Light Source Beamline I-13L for extensive x-ray performance measurements. These measurements confirmed the stability and reliability of the new MLL system. Results are being published in the March issue of the (Journal of Synchrotron Radiation ("Pushing the limits: an instrument for hard X-ray imaging below 20 nm"). “This instrument is a critical link connecting NSLS-II’s bright x-rays to unprecedented nanoscale x-ray imaging capabilities, which we believe will lead to many groundbreaking scientific discoveries”, stressed Yong Chu, the Group Leader of the Hard X-ray Nanoprobe Beamline at NSLS-II. The HXN beamline and the HXN x-ray microscope are currently being commissioned and will be available for user experiments later this year.